Last week, Diego Maradona wrote on Facebook that he wanted to “initiate legal actions” against Pro Evolution Soccer publishers Konami for using his likeness. According to Maradona, it was allegedly done without permission. Today, Konami has issued a response. At this time, there have been news that in Winning Eleven 2017 (international title: PES 2017 Pro Evolution Soccer) there is one player that is being used without permission; however, our company is using [this player] appropriately, with the basis of the license within the contract. 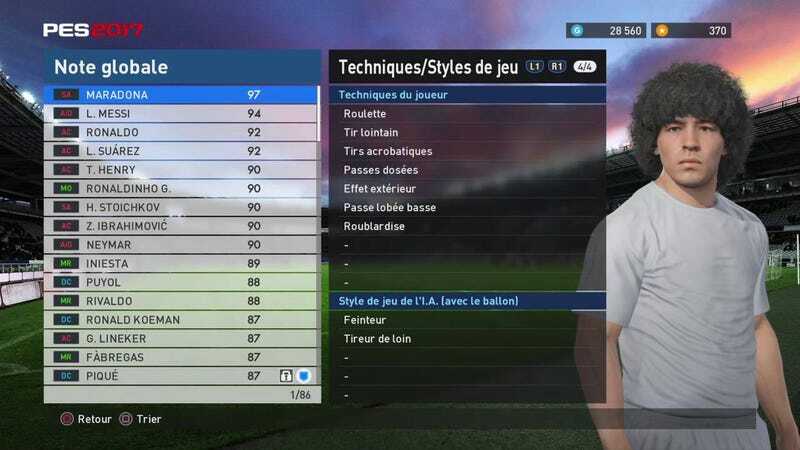 Maradona appears as one of the “Legends” in PES 2017's myClub mode. As Kotaku previously explained, older PES games hid Maradona’s likeness with fictional names, but this latest iteration certainly does not. In case you missed it, check out how PES 2017 stacks up to FIFA 17 right here.